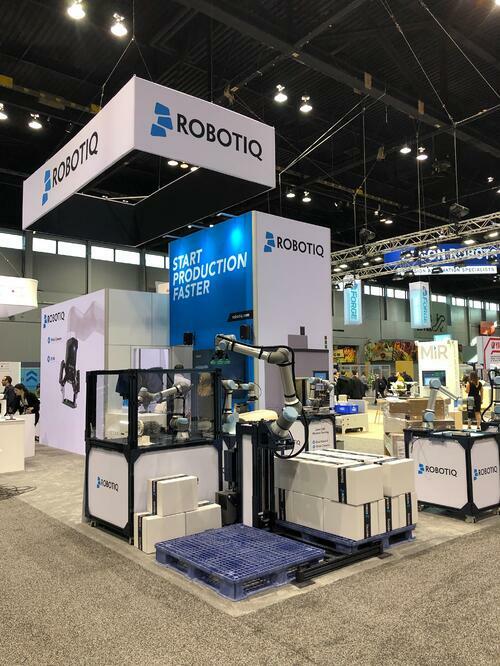 The Robotiq booth is ready, Automate 2019 has officially opened its doors and it's finally time to share Robotiq's great new products and demos with the world! 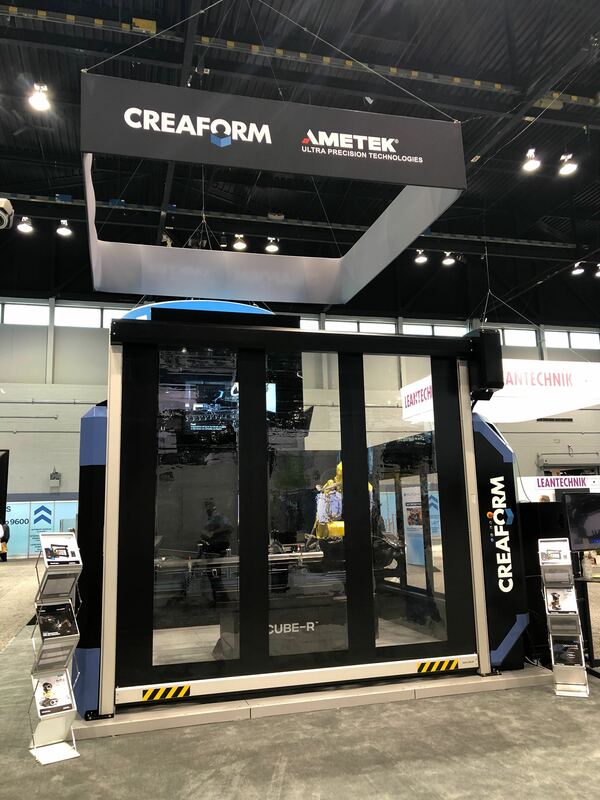 Welcome to Robotiq's coverage of our first day @ Automate 2019! ...and it's finally time to share our exciting new products with you all! 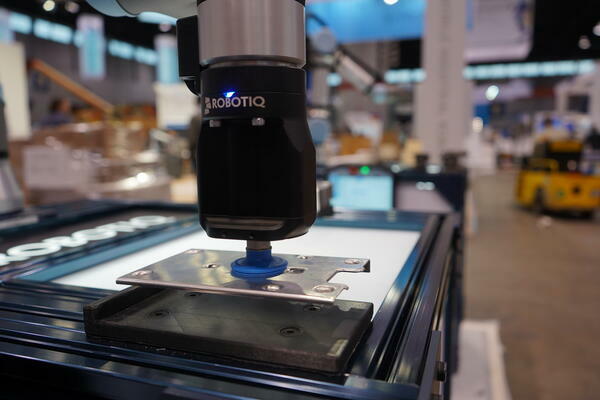 AirPick and EPick are Robotiq's new customizable vacuum grippers designed to give manufacturers full control of automation processes, including pick-and-place assembly, packaging, palletizing, sanding and machine-tending. Suitable for use in a range of industries, Robotiq's new vacuum grippers can handle both uneven and even workpieces made of different materials, such as cardboard, glass, sheet metal (dry) and plastic. 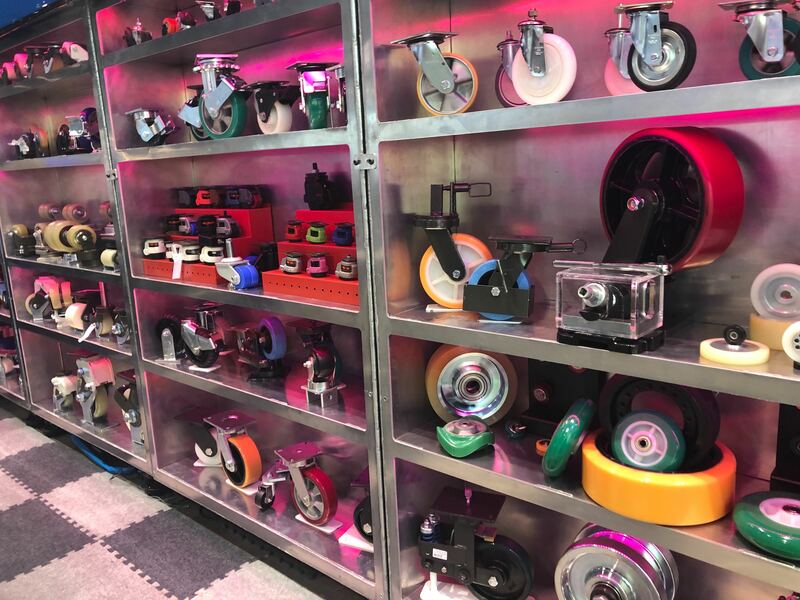 Offering plug-and-play compatibility with all the top cobot brands, AirPick and EPick enable manufacturers to say goodbye to expensive and complicated custom-designed solutions. You can find more information (including product specifications) about these exciting new additions to Robotiq's gripper family right here. Knowing you'd want to see these products in action, we've set up some great demos at the show to showcase AirPick and EPick's capabilities. And the action isn't just at our booth! Our friends at Onexia are showcasing the PalletizUR solution, which combines the AirPick gripper with a cobot from Universal Robots. We're also very happy to launch our Sanding Kit --the world's first hardware and software sanding solution for Universal Robots cobots. Why spend hours programming your robot for finishing applications when the Sanding Kit can reduce set-up and programming time to mere minutes? Leveraging the capabilities of Robotiq's FT 300 Force Torque Sensor, the Sanding Kit features a built-in path generator for consistent force during each cycle --a key feature in finishing tasks that require material removal. Come see the Sanding Kit demo at the Robotiq booth! UPDATE: Engineering.com has already picked up the on the news of our new products! 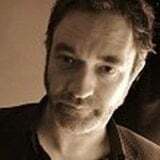 Check out their coverage here. 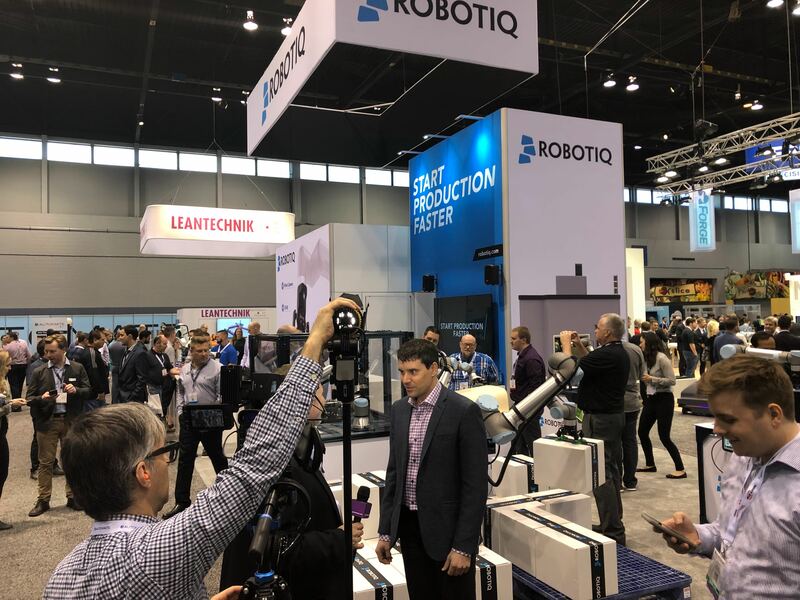 Stay tuned for more Robotiq product demos, sightings of Robotiq products at other booths and the Bots of Automate... all in our roundup of Day 1 later tonight. 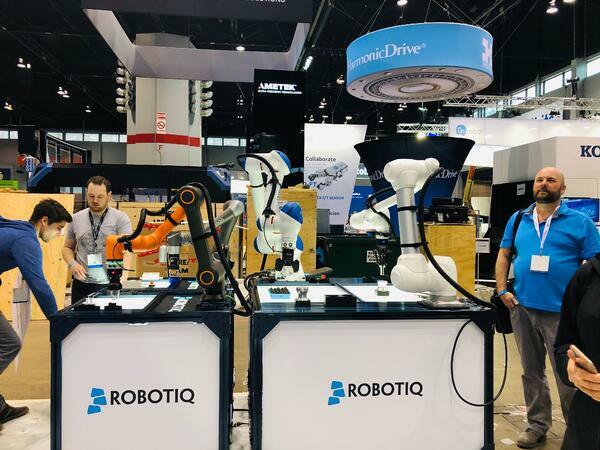 Coming next: 'Why Cobots Are NOT The Challenge,' Robotiq's Etienne Samson explores Lean Robotics cell design @Automate 2019 and shares his essential tips for sucessful cobot deployments! 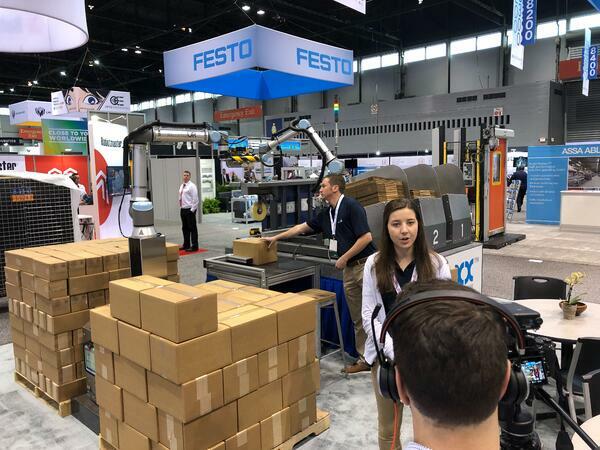 Product launches, Happy Hour, Robotiq product sightings and new cobots: The best of Day 1 at Automate 2019!